Leading Manufacturer of industrial modular floor enclosure cabinet, modular floor enclosure cabinet and modular floor standing enclosure cabinet from Pune. Height 800 mm ~ 2000 mm in pitch of 100 mm. 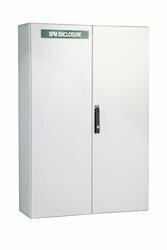 Being one of the reputed organizations in the industry, we are engaged in manufacturing and supplying a quality assured a range of Industrial Modular Floor Enclosure Cabinet. 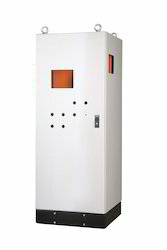 The Floor Standing Enclosure Cabinet offered by us is procured from our reliable vendors. Furthermore, this enclosure is rigorously tested by our quality controllers to ensure its superior quality at the clients' end. 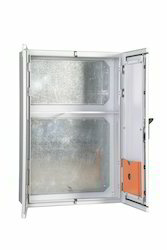 Our valuable patrons can purchase the offered enclosure from us at reasonable prices. Modularity for internal assembly. Doesn’t require more pre-engineering at customer end. Depth-adjustable mounting of component plate and transformer/choke channels on a 25mm pitch. Which rests on a member of the frame structure and thus load is transferred to the base. Mounting nut bolts are used only to hold it vertically. Sheet metal folded base looks attractive with ease in grouting (Grouting holes visible). Removable base covers are also in 3.00 thick. Push the enclosure on round pipe width wise or depth wise. 4 point locking arrangement with rotating centralized lockable handle by lever key to restrict unauthorized access (option of 2-bit key operated lock). Up to 1000 mm width single door, above sizes will have split doors. We are successfully ranked amongst the trustworthy entities offering a wide range of Modular Floor Enclosure Cabinet. This cabinet is pre-engineered at clients’ end before finalizing the design. At our manufacturing unit, we apply aluminum, stainless steel and other metal sheet for developing the cabinets for the clients. Our professionals follow entire industry quality standards during fabrication process. Such fabrication helps in manufacturing a robust and durable cabinet for the clients. Apart from it, clients can get the cabinet from us at cost effective rates. Owing to the expertise of our team of experienced professionals, we are able to introduce an exclusive range of Modular Floor Standing Enclosure Cabinet. At our avant-garde unit, we implement aluminium, stainless steel and another metal sheet for manufacturing the cabinets for the clients. Such fabrication assists in developing a robust and durable cabinet for the clients. Our technicians adhere to industry quality standards during the fabrication process. This cabinet is pre-engineered at clients’ end before finalizing the design. Apart from it, clients can get the cabinet from us at cost effective rates. Looking for Modular Floor Standing Enclosure Cabinet ?